When I was at NYU's Tisch School of the Arts Dramatic Writing program, I made a friend named Harmony Korine who was a very strange guy, and knew more about movies than anyone I'd ever met. This is when I still lived in Queens with my dad, and I commuted to Manhattan everyday on the "N" Train. Harmony also lived in Queens, far out on the "E" train, with his grandmother. I visited him over there once and he showed me one of his dad's films - the documentary I'm posting today - Mouth Music. It was made by Sol Korine and Blaine Dunlap in 1981 as the first program of the ten-part PBS roots music TV series, Southbound. The duo based the series on the work of scholarship folklorist and writer Charles K. Wolfe, who passed away in 2006. Wolfe has no Wikipedia page, which seems wrong, but you can find out about his work here. "MM documents hollerin', jump-rope rhymes, "eephing," nonsense songs, auctioneering, drill sergeant's patter, and even a 'mouth version' of the PBS logo at the end of the show." In his email back to me, Dunlap included this photograph that Sol Korine took during production. 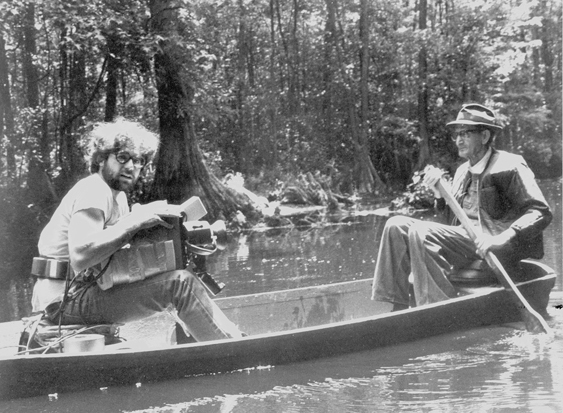 It's Blaine Dunlap videotaping Leonard Emmanuel in the swamps of North Carolina, summer, 1980. HI Frankie - Greetings from Wales (and from an old friend of Blaine Dunlap). Thanks for posting both video and picture. Blaine's a great guy and wonderful filmmaker. It's really good to see there's a revival of interest in his work of late. Do you know this film - http://vimeo.com/12041840 - which he made while an undergraduate student at SMU.